Many people are confused by the term “sugars” on food labels. Sugars are just simple carbohydrates and they come in different forms. They can occur naturally in foods or may be added to foods. Added sugars can be anything from sucrose (table sugar), honey, and agave syrup to dextrose and high-fructose corn syrup. When your child eats foods such as chocolate bars or drinks a soda, they’re consuming foods that are high in added sugars and energy with little or no nutritional value. 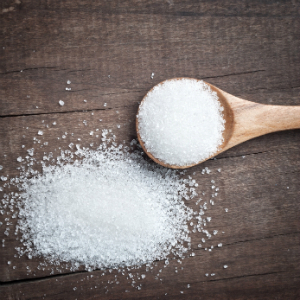 Although these sugars are not “bad”, eating too much of them replaces more nutritious foods, plus there’s the added concern of contributing to dental cavities. Foods that contain naturally occurring sugars such as fruit and dairy products are more nutritious. In addition to sugars, they contain other nutrients like fibre and protein, which make our bodies work a little bit harder to digest them. These foods also provide essential nutrients for our bodies such as vitamins and minerals, which are not found in added sugars. Many of the processed foods available today have large amounts of added sugar. This includes snack foods, crackers, cookies, soft drinks—even soups and salad dressings. But you can do some detective work before you buy: just turn the package over and read the label. Unfortunately you won’t find the detailed info you need on the “nutrition facts” panel where “sugars” are listed as the total of naturally occurring sugars and added sugars. However, the federal government has proposed changes to the guidelines for packaged foods that will require food producers to list added sugars separately. In the meantime, reading the ingredient list will give you a good idea of what’s inside the package. Foods with sugar or added sugar (see examples below) listed in the first few ingredients should be eaten less frequently. And if you’re thinking that it’s better to buy products with added “natural” sugars, think again. Honey and unrefined sugars are no higher in nutrients than plain old white sugar, so choosing foods with these ingredients provides no advantage. What about foods that are labeled “No added sugar”? Maybe you’ve seen cookies, chocolate bars, candies and even ice cream that are labeled “No added sugar”. These foods use alternative sweeteners known as “sugar alcohols” that can cause cramps, gas and diarrhea, especially in children, so they’re not usually a better choice.  Instead of orange juice, have an orange. The taste is the same (even better!) and it provides fibre too.  Encourage your children to drink water to quench their thirst and limit high-sugar soft drinks. Cutting out sweets altogether doesn’t have to be the end goal, but following the recommended number of serving in Canada’s Food Guide will help make everyone in the family less dependent on sweets, and make those special desserts and the occasional soft drink seem like the treats they were meant to be!